So the newsletter coupons finally came back to Total Wine with the New Year. I've been waiting so I could buy a few new ones that showed up over the past few weeks. Hey! Every few dollars is helpful. The one I chose for today's review is Krampus Imperial Helles Lager brewed by Southern Tier Brewing Company in Lakewood, New York. This is one of their big 22 ounce bottles, so I automatically expect it to be great. 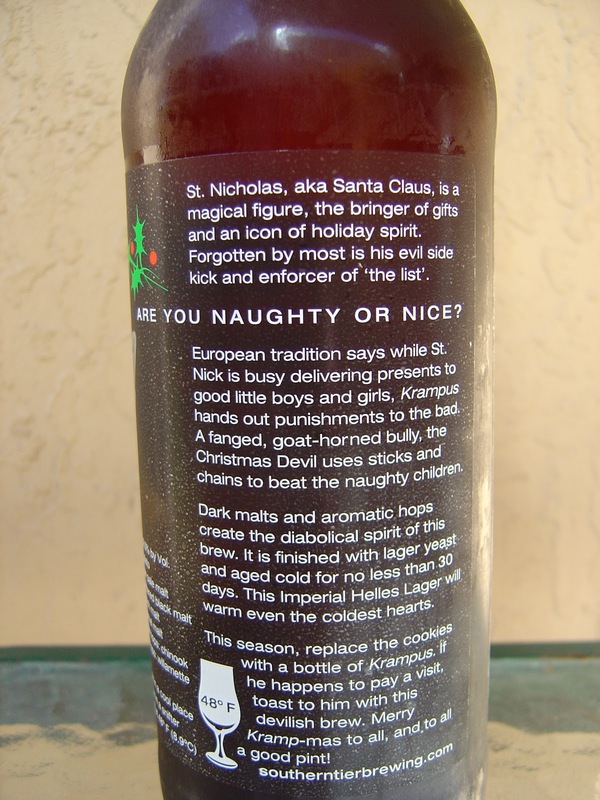 I didn't know who the fanged goat-devil with the long tongue on the front label of the bottle was, so I turned it around and read a very interesting story. 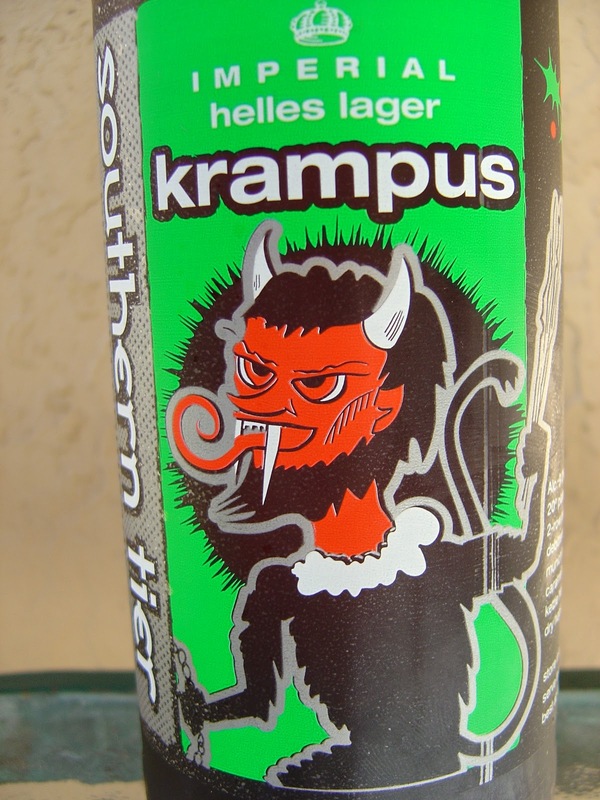 Apparently, that is Krampus, the Anti-Claus. While Santa is out delivering gifts, Krampus is enforcing "the list" and punishing the bad little children by beating them with sticks and chains. Nice! 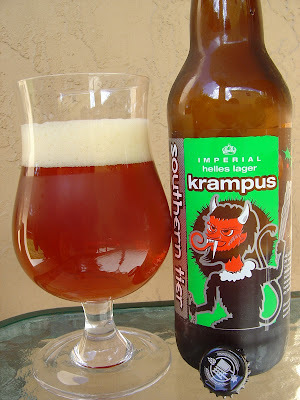 The story finishes... "Merry Kramp-mas to all, and to all a good pint!" Serve at 48 degrees F.
The aroma is very nice: ripe apples and pears, very fruity with a sweet tone to it. Fruity flavors also get things started, malty sweet. Plenty of hops and spicy black pepper, however, comes in to balance those fruits, then sticks around and never leaves. The 9% alcohol is warming and noticeable, but soft and clean and welcome. Some sweet orange enters, and some citric more bitter orange replaces that, kinda cool! Herbal, earthy. And did I mention interesting? Carbonation is on the high end, just fine. Spicy bitter is left behind on your palate. Different than many I've tried. I'd most compare it to Abita's SOS Save Our Shore beer that I tried back in September, mainly because of the clean alcohol/crisp flavor characteristics. Check it out for sure.